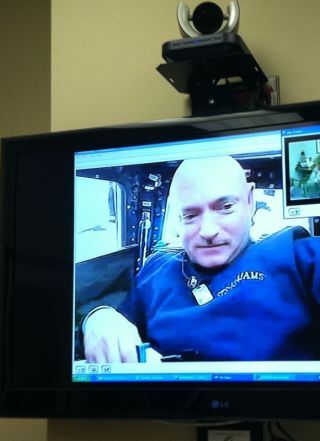 Rep. Gabrielle Giffords posted this picture of her husband, astronaut Mark Kelly, video-chatting from space on her Twitter account. Kelly was commanding the space shuttle Endeavour's STS-134 mission to the International Space Station at the time in May 2011. Flying on space shuttle Endeavour's last mission was the right call for astronaut Mark Kelly, despite the flight's conflict with his wife, Congresswoman Gabrielle Giffords', brain surgery, the veteran space commander said Monday. He has no regrets and he can't wait to see his wife after landing, he added. Giffords, D-Ariz., was shot in the head during an assassination attempt on Jan. 8 outside a Tucson grocery store. Her husband was preparing to command the STS-134 mission of NASA's space shuttle Endeavour, that orbiter's final flight before being retired. Kelly originally took some time off to be with his family, but went back to training for the shuttle mission in February as Giffords' condition improved. Giffords has been recovering at The Institute for Rehabilitation and Research (TIRR)-Memorial Hermann hospital in Houston. "I don't have any regrets," Kelly said. "There were periods of time over the last 16 days where you miss your wife and your kids, and I think that’s true for all of us, but in hindsight, it was absolutely the right decision." What's the first thing he'll tell her after landing? That’s simple, Kelly said. "Probably, 'I'm back,'" he said. Kelly's focus on the mission, while compartmentalizing his concern for his wife at home, might have gotten more difficult two days into the flight, when Giffords underwent brain surgery on May 18. Giffords underwent cranioplasty surgery to replace a portion of her skull that was removed with a plastic implant. The bone had originally been removed to allow her injured brain room to swell, but the procedure was timed to help her heal now that she has made significant progress in recovery. Kelly said the decision to time the surgery for during his mission was a good call, too. "She was ready for the surgery," Kelly said. "The timing worked out where her doctor ideally wanted to do it soon after I launched, and I really trust him, and her mom was there and her dad and other family members. It was good timing so I didn’t want to hold it up by this spaceflight, so we decided to go ahead with it and in hindsight it was absolutely the right decision." The astronauts undocked from the station on May 29, and plan to land back at Kennedy Space Center in Cape Canaveral, Fla., on Wednesday (June 1) at 2:35 a.m. EDT (0635 GMT). During his flight, Kelly has been able to email and call his wife on the phone, and even got to share views of the Earth from space during a video chat with her. Kelly's focus on the mission, while compartmentalizing his concern for his wife at home, might have gotten more difficult two days into the flight, when Giffords underwent brain surgery on May 18Giffords underwent cranioplasty surgery to replace a portion of her skull that was removed with a plastic implant. The bone had originally been removed to allow her injured brain room to swell, but the procedure was timed to help her heal now that she has made significant progress in recoverKelly said the decision to time the surgery for during his mission was a good call, too. "She was ready for the surgery," Kelly said. "The timing worked out where her doctor ideally wanted to do it soon after I launched, and I really trust him, and her mom was there and her dad and other family members. It was good timing so I didn’t want to hold it up by this spaceflight, so we decided to go ahead with it and in hindsight it was absolutely the right decisionAll in all, Giffords' recovery has been going extremely well, according to Kelly and her doctors. "To have her and Claudia and Claire, my two daughters, there, it was really a special moment," Kelly said. "After what happened to her on January 8, the fact that she was able to recover to the point to walk on the airplane, walk off, make the trip to Florida twice. Being away from her, to be honest, it's difficult. Fortunately there's a phone on the space station, there's email, we can communicate, and I'm looking forward to getting back there tomorrow." You can follow SPACE.com senior writer Clara Moskowitz on Twitter @ClaraMoskowitz. Visit SPACE.com for complete coverage of Endeavour's final mission STS-134 or follow us on Twitter @Spacedotcom or Facebook.